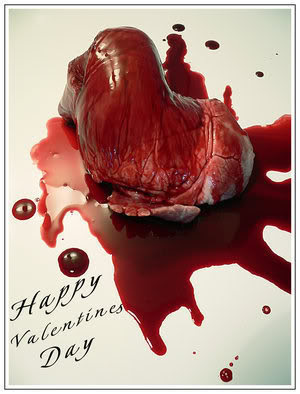 I’ve never much cared for Valentine’s Day. Maybe it’s because I’ve never had a girlfriend on Valentine’s Day. Yeah, that’s probably it. Oh well. Let’s put that aside. Typically I put out a short story or a piece of sketch comedy or something on Valentine’s Day, and I was aiming to do the same thing this year with my short story The Happy Seat but I’m really not satisfied with the draft I have of it yet. It will probably have to wait another week. Just as well, I suppose, since if my sales for the day are any indication, the national day of love is not a great business day for those of us who pedal stories of dismemberment, disembowelment, and destruction — probably more Fourth of July type subject matter. Anyway, that’s all I’ve got. Look for The Happy Seat next week, a short story about Valentine’s Day, young love, and executing the mentally handicapped. This entry was posted in Uncategorized and tagged comedy, dark comedy, funny, valentine's day, video. Bookmark the permalink.